Kristine here with my last post of the month. 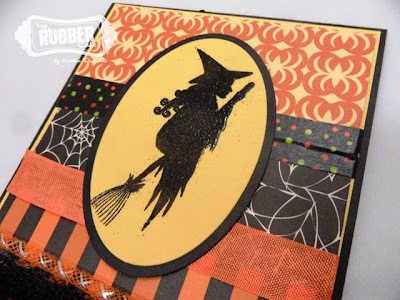 I have two more projects left to share that I made with this months Creative Cafe' Kit of the Month - Best Witches. 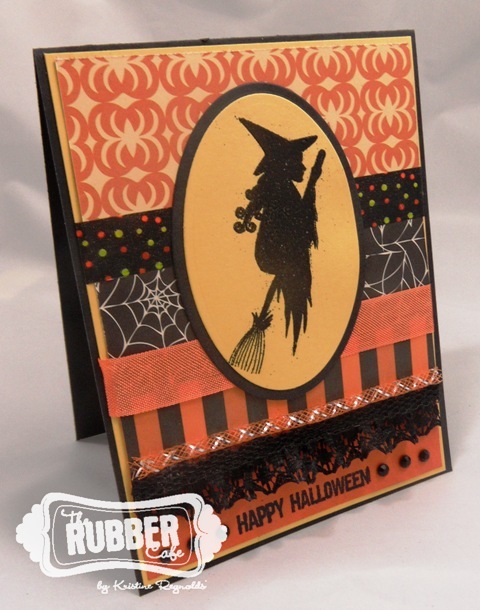 The first card is a card I made using lots of the yummy patterned paper that comes with the kit. I started by adhering three different patterned papers on to a yellow cardstock panel. I adhered an orange panel to the bottom below all the patterned papers. Then I stamped the sentiment with Versamark ink and heat embossed with black embossing powder. I added three Queen & Co. black rhinestones on each side of the sentiment. I wrapped a piece of washi tape and a piece of orange ribbon around the card between the patterned paper panels. I wrapped the orange and black trims around the panel too. And yes! 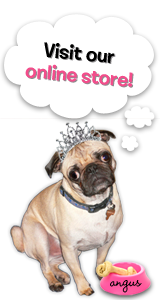 All of these amazing riibons, trims, rhinestones, and washi tape come in the kit! Finally, I adhered the entire panel to a black card with Scrap Happy Glue. 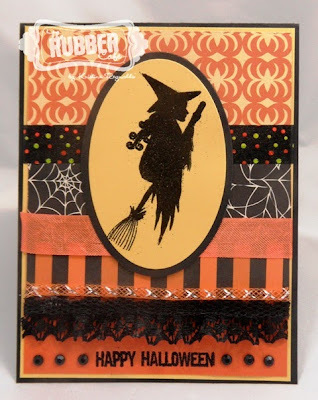 For the main panel I stamped the witch image on a die cut yellow oval with VersaMark ink and heat embossed with black embossing powder. Then I backed it with a black die cut oval and adhered it to the card with Scrap Happy Glue. Here's one last look at the completed card! 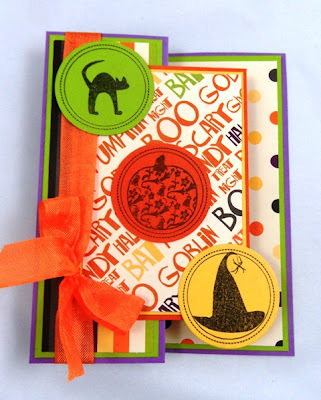 The second card I have to share today is a fun Z-Fold card that I made with the regular Creative Cafe' Kit as well as the awesome add on stamp set-Halloween Elements. 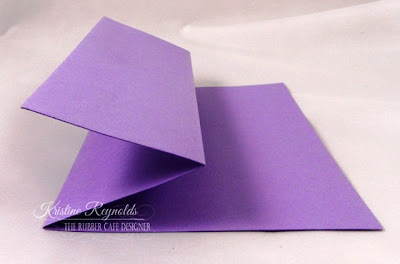 To make a Z Fold card start with a 5 1/2" x 8 1/2" piece of cardstock. 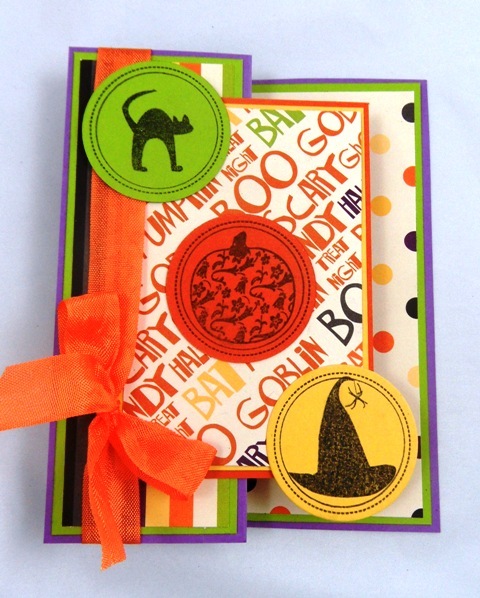 Fold it in half to create a 4 1/4" x 5 1/2" card. The main panel with the words is 4 1/2" x 3 1/2". 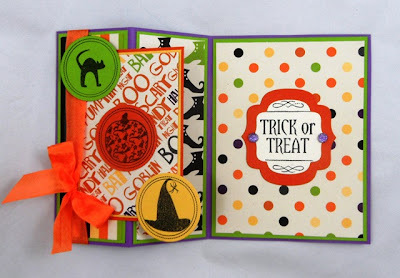 I used my Spellbinders Circle Dies for the three circle panels. First I stamped the circles and images with Memento Tuxedo Black dye ink and then just chose a circle die that was slightly larger. The inside of the card was stamped with stamps from the Add on set, Halloween Elements. 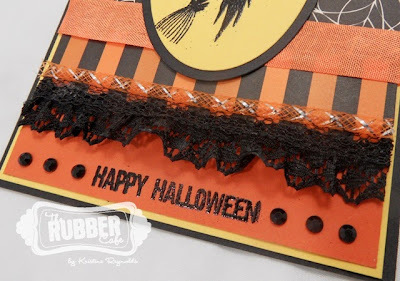 The fabulous orange ribbon and the pretty purple rhinestones are from the kit too! Here's one last look at this card when it is closed up. I hope you enjoyed my two cards today and that all of the great DT samples are giving you lots of ideas for using your Creative Cafe' Kit! 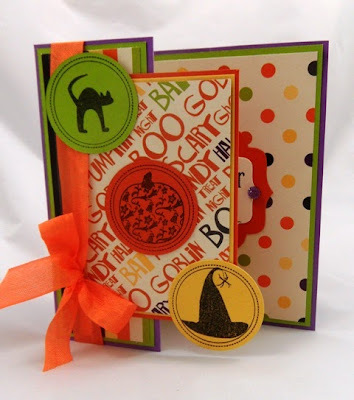 Tools/Dies: Spellbinder Classic circle, Label, Oval and Scallop Oval dies.